Spey casting tuition, Canada and USA. 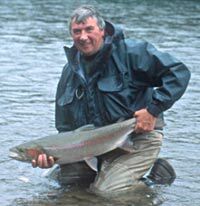 Ally Gowans will be heading will teach at The Bow River Troutfitters Spey Casting School in September 2005. The event will be held atthe North Bow Lodge near Calgary. Come and learn from one of the World's most respected Spey fishermen how to cast and fish using the length and power of the Spey rod to mend and control the drift of the fly. During the course you will be taught how the Spey cast works and after some practice you should be able to make single and double Spey casts with confidence and to identify your own mistakes and correct them. Fishing is not all about casting, but to have confidence and and cast with ease is a sure way to enjoy your fishing with greater success in the future. The school is specifically designed to help the steelhead angler. It covers the important fundimentals of Single and Double Spey casting, Snake rolls, and overhead casting with two-handed rods and continues to teach the most advanced practical casting and fishing techniques. It also includes Spey casting with single handed rods and the use of hauls to achieve single handed roll casting performance that will surprise you. This is probably the most comprehensive casting course available anywhere and it is guaranteed to make you think again about how you cast and make it easier on your body. During the course there is lots of information exchange, tips about designing and making sink tip and sinking lines and I daren't even mention fly patterns! You can decide what you want to learn, just ask Ally! You may like to use a double tapered line, a long belly WF or a short heavy shooting head. Ally does not mind because he will help you to get the best out of your tackle, whatever it is. A range of rods and lines will be made available for you to try during the course, take the mystery out of your future investment, make comparisons and purchase with comfort but remember that the most important part of the whole outfit is the "nut" holding the handle. This course will teach you how to loosen the nut and handle your rod and line with ease. If you really want to know how to make long controlled casts with the minimum of effort this is the school for you. For a full programme contact: Mike Day at Bow River Troutfitters Phone +1 800 854 0464 or if you have any queries about casting or Spey fishing contact Ally Gowans Phone/FAX +44 (0)1796 473718. School packages including accommodation and/or fishing on the Bow River are available, speak to Mike.